You probably wouldn’t expect Phoenix to be the most Italian of cities. After all, there is not Little Italy and the Mafia is more of an East Coast thing. Yet, Phoenix definitely has some homegrown Italian favorites and Babbo is one of these. 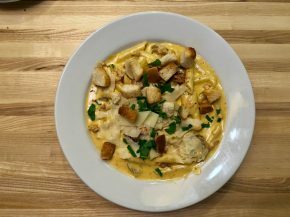 Babbo invited me out to its Scottsdale location for a hosted dinner and I took them up on the chance to check it out. It’s like Buffalo and Texas together. Goodyear is really far away when you live in Scottsdale. Like, it feels like it’s in an entirely different state. Like, when you drive there you feel like you may as well be driving to Los Angeles. So, I figured if I was going there I might as well make an afternoon of it and grab lunch as well. Thus, I found myself at Haymaker, which is like a family friendly sports bar that almost feels like a chain, but isn’t. The world has a few different styles of pizza: New York, Italian, Chicago, Detroit, etc. Yet, it takes a bold pizza purveyor to deliver something that doesn’t quite fit into a predetermined style. 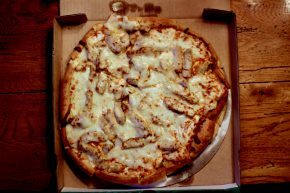 Mancino’s Pizza, which seems to have a series of somewhat affiliated locations around the midwest, has done just that. It was in Petoskey, Michigan that I snagged one of these pizzas for the first time. Ever since 800 Degrees hit the scene, it seems like quickie custom pizza shops have shown up everywhere. Pieology is one of these places and it follows in the same assembly line style of others before it. 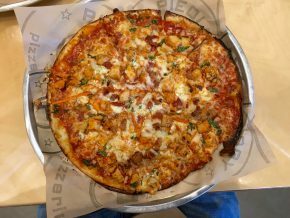 The ingredients are essentially the same as Blaze Pizza, but with a few tweaks here and there in the sauce department. The little village of Rhinebeck in Upstate New York is really one of the more uninteresting small towns I’ve ever seen. I’m sure it’s refreshing coming from New York City, but coming from Pittsburgh, which is filled with small town-like neighborhoods, I couldn’t help but feel bored. Yet, that didn’t stop me from popping into Village Pizza for lunch. So much sliding to do. Down under the Ambassador Bridge that connects Detroit to Windsor is a wait that challenges that of the border crossing. It’s called Green Dot Stables, on the Detroit side, and when we arrived we were told the wait would be more than an hour. Considering the fact that the majority of Detroit is abandoned, we were shocked, but also excited by the prospect of people finding more excuses to head into the city. In a blue state of mind. When I visited a couple of friends in Ypsilanti, Michigan, they recommend we head to The Wurst Bar, which is a pun-filled name only made better by the fact that this is right next door. There is a massive amount of beer to choose from, but since I was about to embark on a drive to Pittsburgh, I didn’t think any of that was a good idea. Instead, I focused on which brat to order, and this, too, was a large list to choose from. It’s easy to make a sandwich special by putting unique items into it. I still applaud places like that, but it something even more special to take a pretty basic sandwich and make it exceptional. 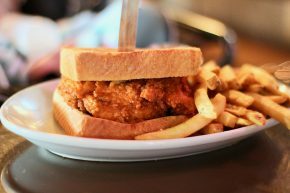 I always loved Bay Cities for doing this in LA (in no small part because of the bread), and while it is nothing at all like Bay Cities, I have found a place that follows the same mold in Buffalo. It is called John & Mary’s Subs, and while it seems like your average Buffalo subs and tacos spot, I found my sub to be much more. Over in Lewiston for a nice little night of music in the Artpark, I found my way to a food truck called Macarollin’. Interestingly enough, this truck wasn’t some old school taco truck, but more of a U-Haul truck, which I’m guessing had to go through some sort of crazing zoning board before getting to sell food. But I digress, Macarollin’ served only four things on their menu and they were all varieties of mac and cheese. This was a good thing, because I hate it when food trucks try to do to much. Pizza is a social food. Wife won a gift card to Social at Bakery Square a while back and we finally got a chance to use it recently. In fact, we made it a social thing and invited out a couple to join us. As I learned during the meal, the feminine half of the couple has her own food blog, which focuses on nutrition, so I naturally thought we were very similar. That is, until she ordered a salad. Crazy, I know.